Walking down the aisle and committing yourself to a life of partnership is pretty stellar. That’s big a reason you end up with ton of gifts piled up in your [new] living room. Your friends and loved ones have taken the time to pick out something they think you’re going to love. Or maybe they just blindly picked from your registry — that’s probably best anyway. Either way, each gift comes from a place of thoughtfulness which deserves a proper wedding thank you card. Wouldn’t you agree? 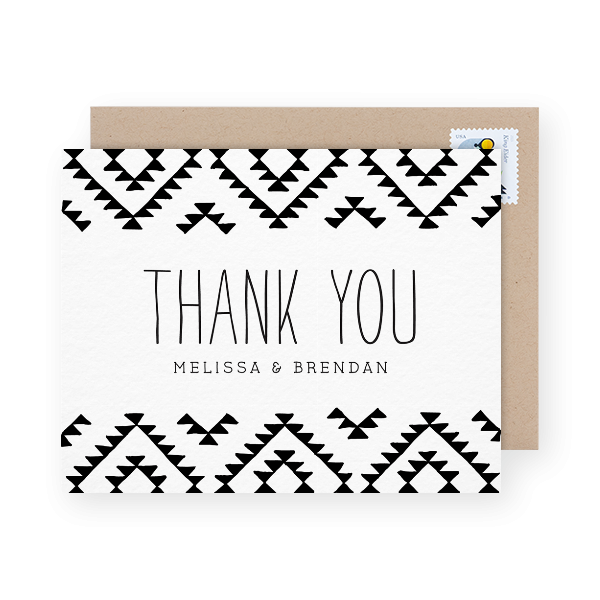 Love these designs, but feeling a rush of overwhelming panic when you start to think about all the thank you cards you have yet to write? Don’t worry, we’ve got a pretty neat life hack that will help you actually finish your custom wedding thank you cards in record time. If you’ve been putting off this task for months on end, nows a good time as any to get a jump on it. You’ll be done before you know it. And if you used the handy export tool from Zola, just import your spreadsheet into your Postable account to finish your wedding thank you cards in minutes. Not sure how your photos will look? Just click on the links below each card and test out your photos with each template. 1. This simple branch custom wedding thank you is perfect if you decided to go for a more vintage or even a rustic feel at your wedding. The branches are a great little accent to the scripted ‘thank you’ and you can customized the card with your names. 2. Another simple design, this picnic thank you card is perfect for a wedding theme like an outdoor BBQ or a barn-styled wedding. Whatever your theme, this design is an adorable way to give your appreciation. 3. 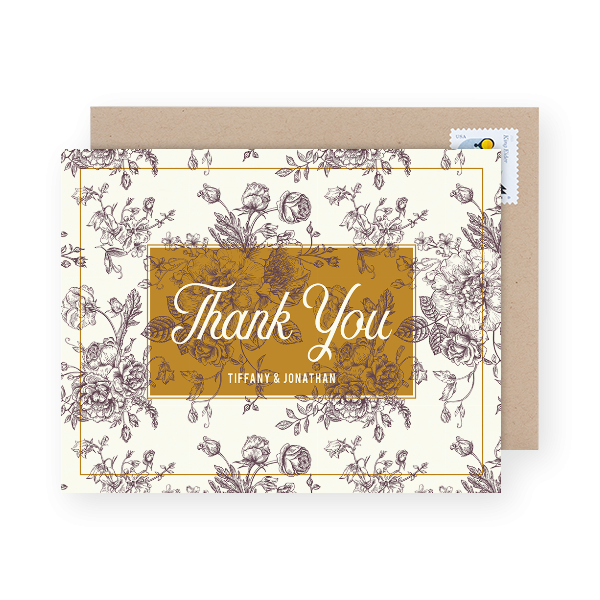 This victorian thank you design would work great if you went for a vintage feel or something a little more elaborate. The beautiful rose design with the purple and gold color scheme give this design a classier feel. 4. 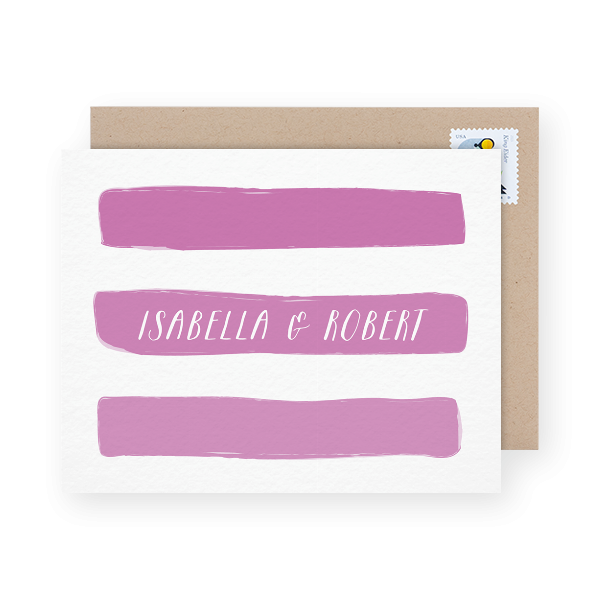 This painted lines design is a great custom wedding thank you cards if you’re looking for something casual. 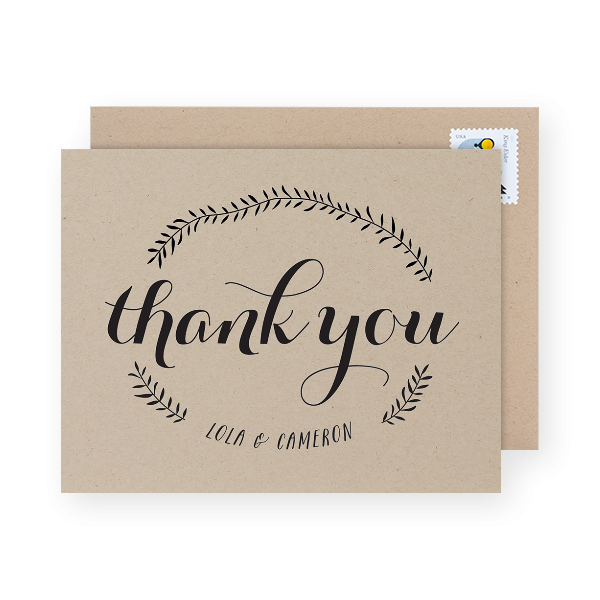 If you used a similar color scheme for your wedding and are looking to keep your thank you cards nice and simple, this design would be a winner. 5. 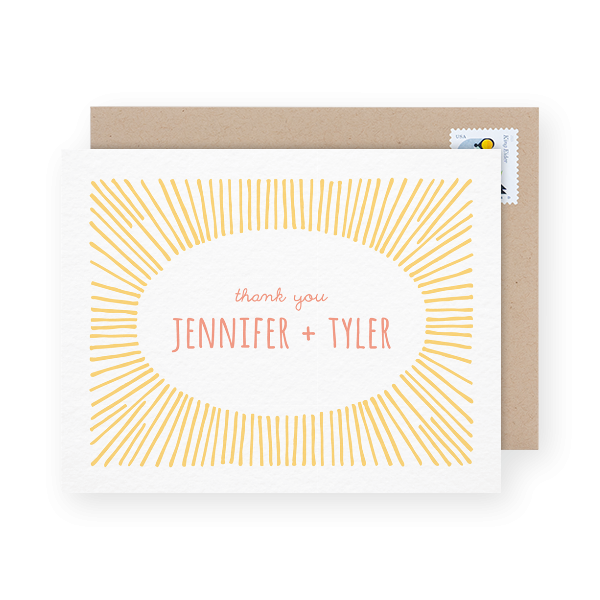 This sunburst wedding thank you card is perfect for those beach wedding themes. 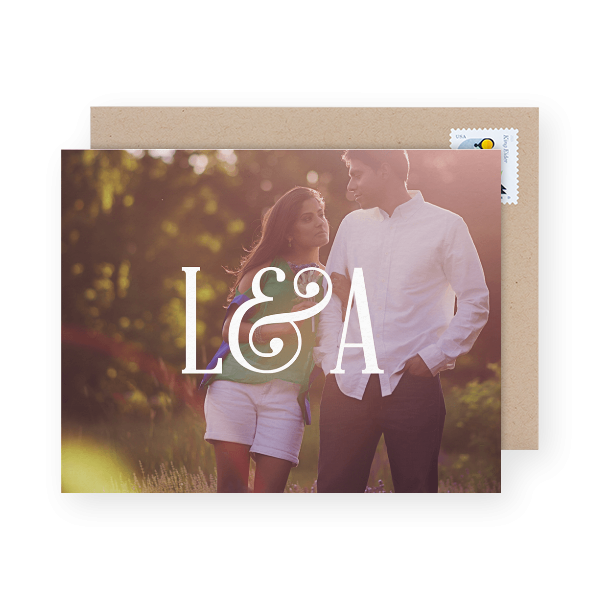 Or perhaps you’re just looking for custom wedding thank you cards to brighten your guests’ day while giving your thanks. Send them a little sunshine with this design. 6. 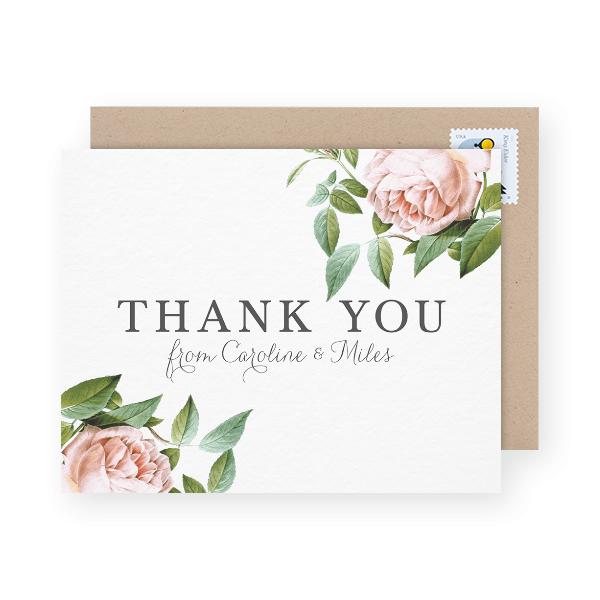 This vintage botanical thank you card design is great if you chose a floral theme at your wedding. The scripted font used for the custom names on this design adds a little class to the card as well. Pro tip: You can write all of your wedding thank you cards straight from your computer. Just customize your names, type out your personal messages using one of the handwritten fonts and click send. Postable will take care of the rest. 7. This shield and arrows wedding thank you card design is fun and bright without being overpowering. If you’d like to keep your wedding thank you cards simple and modern, this design will be perfect for you. 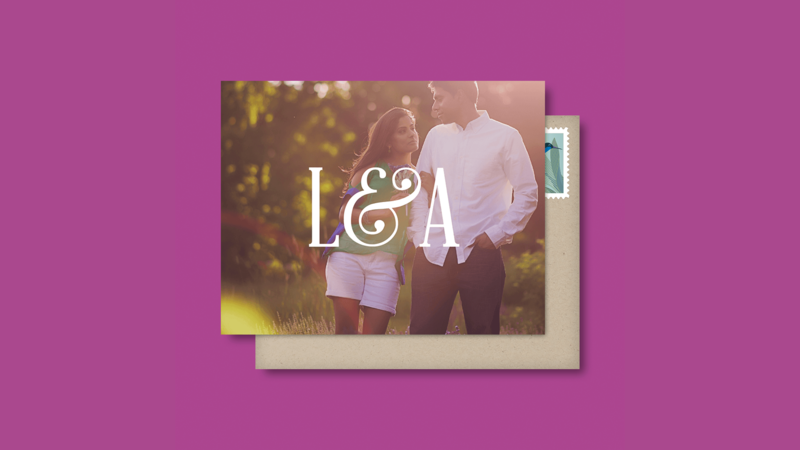 Just add your initials to make the cards personal. 8. It doesn’t get classier than a simple script. 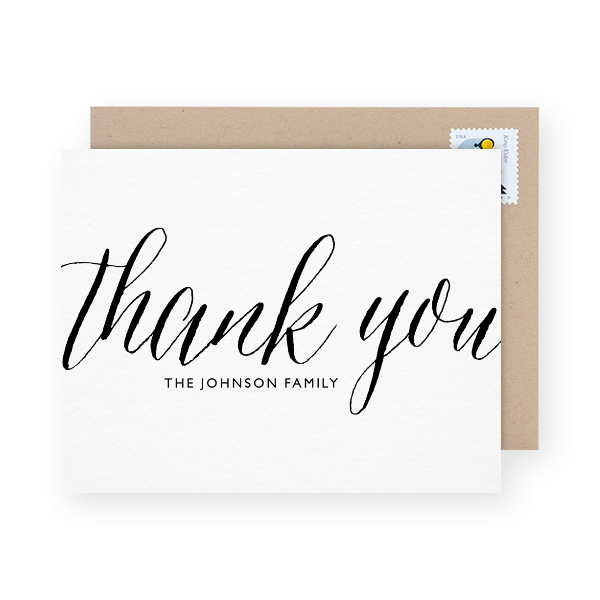 This polished thank you card will be appreciated by all of your guests and you can use your new family name (how exciting!). 9. Love patterns? This Kilim design will likely be your pick. The thin lettering is a nice simple way to personalize your names. 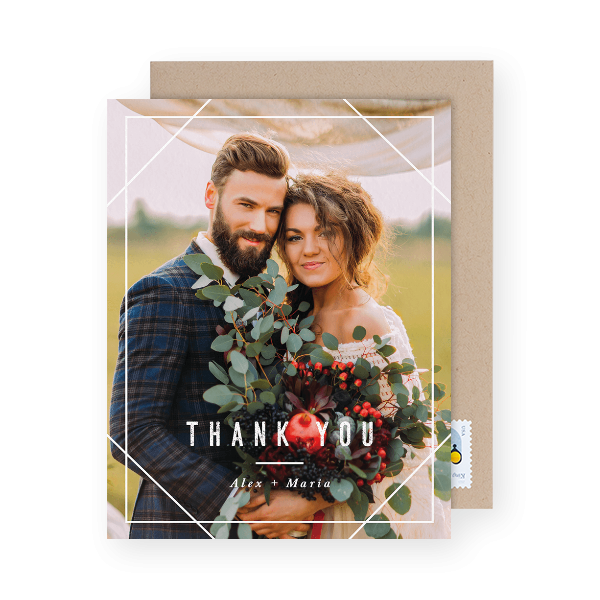 A great way to give thanks for all those new wedding gifts is with wedding photo thank you cards. You can finally put those beautiful wedding photos to good use! Your guests will love seeing the beautiful shots and they will serve as a lovely reminder of your wedding day. If your wedding photos aren’t quite ready, you can also opt to use your engagement photos to give the cards a more casual feel. Whatever photo(s) you choose to use, be sure to upload the highest resolution quality so that the thank you cards print well. Checkout these tips for creating the best quality custom cards. 10. 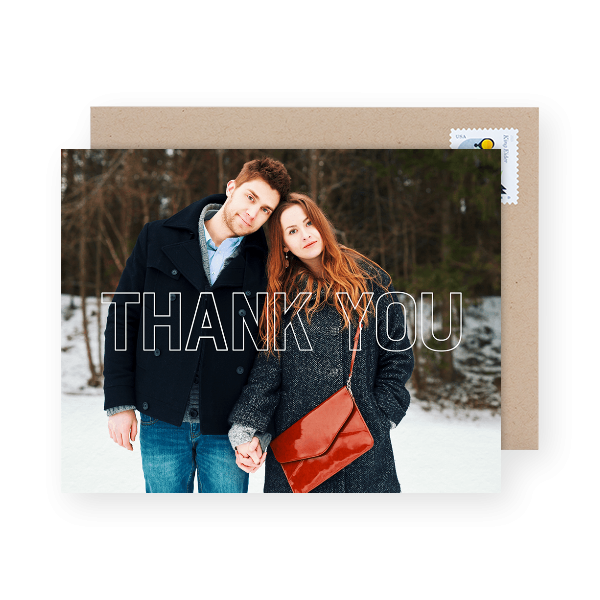 This simple photo wedding thank you card lets your picture remain the focus. The block lettering is transparent so it keeps most of your image visible. 11. This design allows you to upload an image along with customizing your names. The simple scripted thank you also adds a little class to the design. 12. 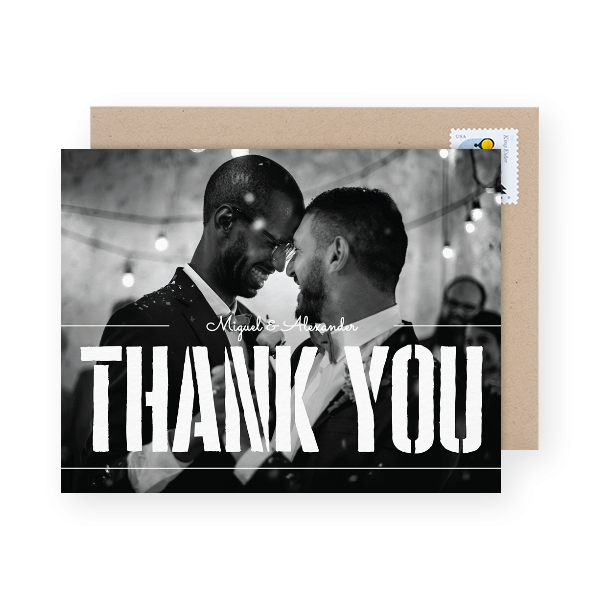 Think simple and bold with this photo wedding thank you card. 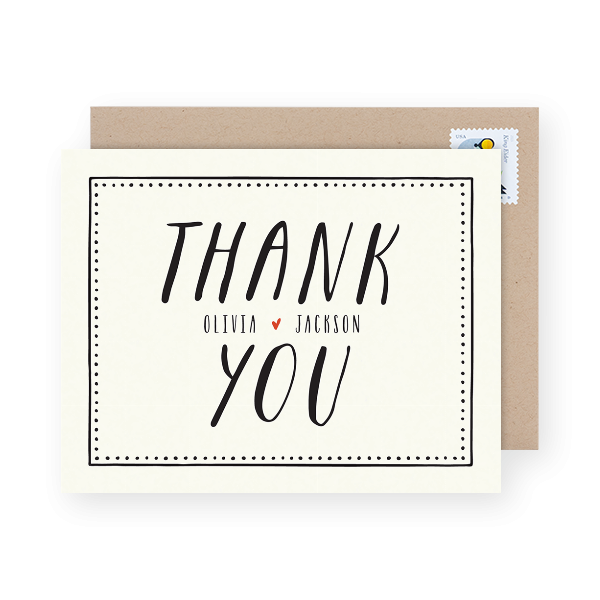 You’ll want to keep the main focus of the image on the upper portion of the card to avoid clashing with the bold ‘thank you’. 13. A little vintage feel with these photo wedding thank you cards. We love the vintage over-lay that will automatically be applied to your photo and the fun lettering in the center that allows you to add your initials. 14. An adorable design featuring a banner ‘thank you’. 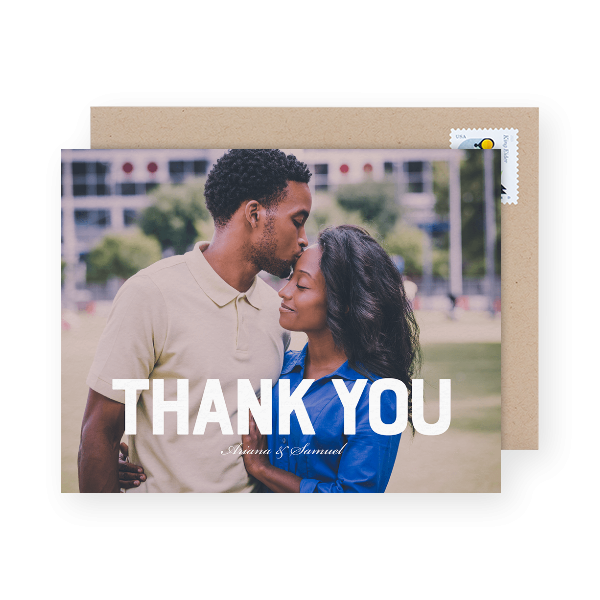 These wedding photo thank you cards have a little more pizazz than the others, but will only work with a photo that places the main focus towards the bottom. We love the little heart and arrow accent! 15. Looking for something a bit more simple with a taste of casual stride? This full bleed photo thank you card fits the bill. The cursive font is classy, but the brush stroke font adds a more casual tone to the design. 16. 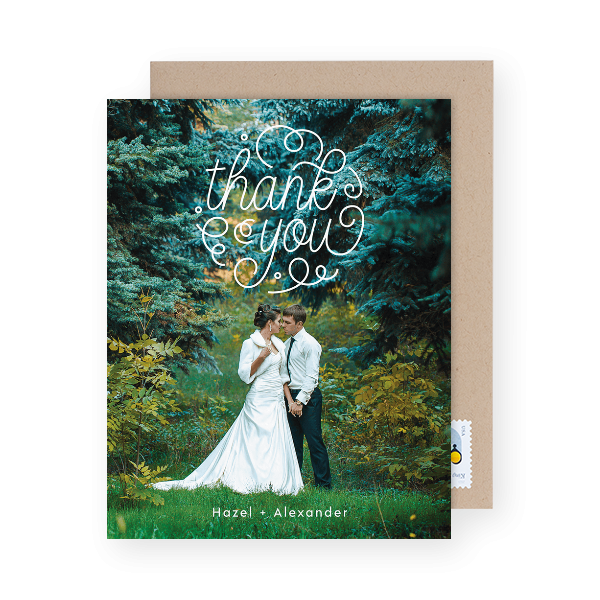 Bold with a touch of tiny script — this photo wedding thank you card is the combination of two opposites. We love the small script font intended for the names. If you have a photo where the main part of the image (the faces) are on the upper half it will work nicely here. 17. For something on the twirl-ier side of things, this whimsical design will be perfect. Make sure to choose a photo that has darker objects on the upper half of the image so that the ‘thank you’ is easy to see. 18. For a modern geometrical flare, this design will surely tickle your fancy. Fairly easy to fit just about any vertical image. We love the the way the lines end up bordering the image.